R. O. Kwon's pensive debut novel, The Incendiaries, arrives just in time to stoke up "back-to-school" anxieties, especially those of entering college students and their nervous parents. The Incendiaries is a campus novel, and so, true to form, it charts a well-worn path from eager innocence to bruised experience. Think of classic campus novels like F. Scott Fitzgerald's This Side of Paradise and Donna Tartt's The Secret History — or even farther afield narratives like Tom Wolfe's I Am Charlotte Simmons and Fangirl, by Rainbow Rowell. However it riffs on the particulars, the standard campus novel always features an impressionable main character destined to fall under the spell of a charismatic professor — or another student, or a closed club or, perhaps rarest of all, an academic subject. Whether the infatuation is sexual, social or intellectual, the once naïve protagonist always pays for the experience in pain and a permanent case of wistfulness. The Incendiaries tweaks the conventional campus novel formula in a few crucial ways: First of all, some of the key characters here are Korean-American. Phoebe Lin is a beautiful first-year student going off the rails at the elite and fictitious Edwards University. Phoebe was raised to be a concert pianist, but she came to doubt her own gifts. When her mother died in a car accident, Phoebe fell into a long tailspin of guilt. She is, therefore, ripe for manipulation when she arrives at Edwards and meets a mysterious character named John Leal outside a club one night. An older drop-out from Edwards, Leal is half-Korean and boasts of a past that includes time spent in a North Korean prison. He's also perfected the art of the come-on line. He tells Phoebe at the end of their first encounter: "I'd love to see you again, ... It's up to you, though. Call me when you're tired of wasting this life." It turns out that what Leal really has in mind is drawing Phoebe into the extremist religious group he's established on campus. Watching this seduction unfold with horror is Phoebe's boyfriend, Will Kendall, a sophomore transfer from a Bible college. Will is that other mainstay of the campus novel: the alienated scholarship student. Obliged to wait tables to make ends meet, he cynically passes judgment on his fellow students at Edwards, who, he says, seem to have been "admitted into this pinnacle of learning with the single purpose ... of having fun." Clearly, Kwon shares Will's low estimation of the intellectual curiosity of the average undergrad: I'm pretty sure this is the first campus novel I've read that doesn't include even one classroom scene. Personally, I would have liked a few, along with a more sweeping panorama of student life on the Edwards' campus, but Kwon isn't interested in academic satire or a collegiate novel of manners. Instead, in The Incendiaries, Kwon vividly explores a subject that's rarely raised in mainstream novels about life on campus these days: that is, the allure of a belief in God — or at least the things that a belief in God provides. In the force of his certitude, John Leal is like a John Brown figure, drawing his followers into a community (or cult) and inciting them to activism. The younger characters here are vulnerable because they wobble in doubt. That's especially true of Will, who left Bible college because he lost his faith; yet, he still yearns for it with the resentment of one who's been deeply disappointed: "I used to love imagining [God's] hand upon me, [Will tells us]. The God I followed had been as real to me as a living person — more real, since I'd put so much into inventing him." Kwon structures her novel as a fractured flashback in which all the characters get their say; so, from the opening page of The Incendiaries we know things don't end well. Sometimes Kwon's style can get a bit too doggedly lyrical, but she's deft at moving the plot toward its explosive climax. 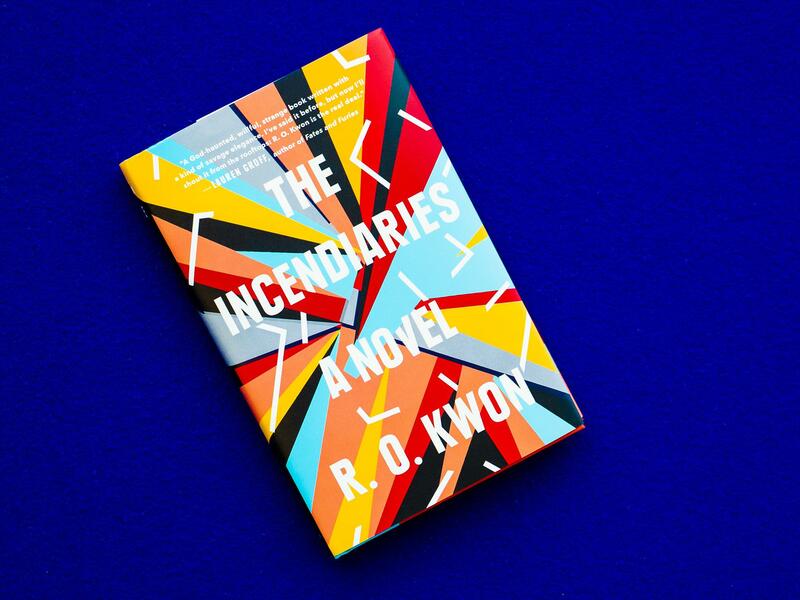 In The Incendiaries Kwon has created a singular version of the campus novel; it turns out to be a story about spiritual uncertainty and about the fierce and undisciplined desire of her young characters to find something luminous to light their way through their lives. This is FRESH AIR. R.O. Kwon is the first-time novelist whose debut, called "The Incendiaries," has lit up many summertime must-read lists. Our book critic Maureen Corrigan has this review. MAUREEN CORRIGAN, BYLINE: R.O. Kwon's pensive debut novel, "The Incendiaries," arrives just in time to stoke up back-to-school anxieties, especially those of entering college students and their nervous parents. "The Incendiaries" is a campus novel, and so true to form, it charts a well-worn path from eager innocence to bruised experience. Think of classic campus novels like F. Scott Fitzgerald's "This Side Of Paradise" and Donna Tartt's "The Secret History" or even farther-afield narratives like Tom Wolfe's "I Am Charlotte Simmons" and "Fangirl" by Rainbow Rowell. However it riffs on the particulars, the standard campus novel always features an impressionable main character destined to fall under the spell of a charismatic professor, or another student, or a closed club or perhaps rarest of all, an academic subject. Whether the infatuation is sexual, social or intellectual, the once-naive protagonist always pays for the experience in pain and a permanent case of wistfulness. "The Incendiaries" tweaks the conventional campus novel formula in a few crucial ways. First of all, some of the key characters here are Korean-American. Phoebe Lin is a beautiful first-year student going off the rails at the elite and fictitious Edwards University. Phoebe was raised to be a concert pianist, but she came to doubt her own gifts. When her mother died in a car accident, Phoebe fell into a long tailspin of guilt. She's therefore ripe for manipulation when she arrives at Edwards and meets a mysterious character named John Leal outside a club one night. An older dropout from Edwards, Leal is half-Korean and boasts of a past that includes time spent in a North Korean prison. He's also perfected the art of the come-on line. He tells Phoebe at the end of their first encounter, I'd love to see you again. It's up to you, though. Call me when you're tired of wasting this life. It turns out that what Leal really has in mind is drawing Phoebe into the extremist religious group he's established on campus. Watching this seduction unfold with horror is Phoebe's boyfriend, Will Kendall, a sophomore transfer from a Bible college. Will is that other mainstay of the campus novel, the alienated scholarship student. Obliged to wait tables to make ends meet, Will cynically passes judgment on his fellow students at Edwards, who, he says, seemed to have been admitted into this pinnacle of learning with the single purpose, from what I could see, of having fun. Clearly, Kwon shares Will's low estimation of the intellectual curiosity of the average undergrad. I'm pretty sure this is the first campus novel I've read that doesn't include even one classroom scene. Personally, I would have liked a few, along with a more sweeping panorama of student life on the Edwards campus. But Kwon isn't interested in academic satire or a collegiate novel of manners. Instead, in "The Incendiaries," Kwon vividly explores a subject that's almost never raised in novels about life on campus these days - that is, the allure of a belief in God, or at least the things that a belief in God provides. In the force of his certitude, John Leal is like a John Brown figure, drawing his followers into a community or cult and inciting them to activism. The younger characters here are vulnerable because they wobble in doubt. That's especially true of Will, who left Bible college because he lost his faith. Yet he still yearns for it with the resentment of one who has been deeply disappointed. I used to love imagining God's hand upon me, Will tells us. The God I followed had been as real to me as a living person, more real since I'd put so much into inventing him. Kwon structures her novel as a fractured flashback in which all the characters get their say. So from the opening page of "The Incendiaries," we know things don't end well. Sometimes Kwon's style can get a bit too doggedly lyrical, but she's deft at moving the plot toward its explosive climax. In "The Incendiaries," Kwon has created a singular version of the campus novel. It turns out to be a story about spiritual uncertainty and about the fierce and undisciplined desire of her young characters to find something luminous to light their way through their lives. DAVIES: Maureen Corrigan teaches literature at Georgetown University. She reviewed "The Incendiaries" by R.O. Kwon. On tomorrow's show, understanding the hate and violence in Charlottesville - ProPublica and "Frontline" PBS correspondent A.C. Thompson spent months investigating white supremacist organizations and their members who came to the Unite the Right rally last year ready for battle, one of them an active-duty Marine. Thompson's reporting appears online and in a "Frontline" documentary Tuesday. Hope you can join us. DAVIES: FRESH AIR's executive producer is Danny Miller. Our technical director and engineer is Audrey Bentham. Our associate producer for digital media is Molly Seavy-Nesper. Roberta Shorrock directs the show. For Terry Gross, I'm Dave Davies. (SOUNDBITE OF ANKE HELFRICH FEAT. TIM HAGANS' "THINK OF ONE") Transcript provided by NPR, Copyright NPR.